Just when you thought it was safe to go back to the airwaves...he's back. Production Summary: Thirteen songs were recorded for this album, but only twelve songs were written specifically for it. "I Was Only Kidding" was originally written with the Alapalooza album in mind, but Al decided that by the time that album was completed the lyric "I really love you...not!" might not have aged very well. So he recorded "Kidding" at the last minute in order to include it onto this album, bumping the already-recorded "Waffle King." "Waffle King" would instead be used as the b-side to the "Smells Like Nirvana" single before eventually appearing on Alapalooza. The first Al studio album to not be released on vinyl but rather only CD and cassette. Al's first album to be initially distributed by BMG Music. Debuted at #24 in Billboard, the highest debut of Al's career at that time (a record that would last until 2003). It would land in the top twenty just two weeks later, where it would stay for another three weeks. It would eventually stay on the "Billboard 200" chart for twenty-seven weeks, also a record for an Al release at that time (one that would be broken in 1996). Approximately half of the songs on this ALbum were recorded throughout 1990, but the lack of a strong enough lead-off parody delayed the completion of this album for nearly two years. Al had tried writing several Milli Vanilli parodies separately (such as "Blame It On The Drain," "Don't Forget My Plumber," etc.) before combining them into "The Plumbing Song." ALbum title/song connection: The title and cover concept feature Al parodying Nirvana's Nevermind album cover, while the lead-off single is parodying Nirvana's "Smells Like Teen Spirit" (from Nevermind). About ten minutes after the song "You Don't Love Me Anymore" ends, Al's "Bite Me" appears on the compact disc as a hidden song. 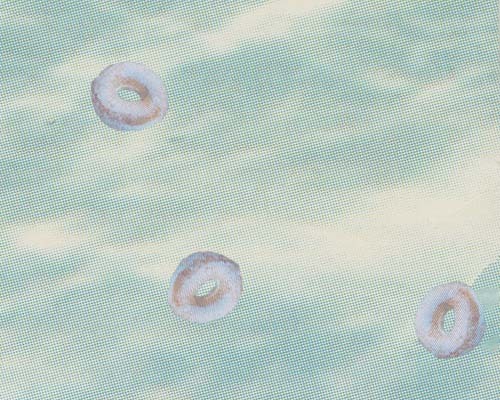 A take-off of Nirvana's Nevermind album bonus track "Endless, Nameless" (but not a direct parody), "Bite Me" is a quick snippet of grunge-like guitar noise and Al screaming (among other noises). An edited version of this song would end each episode of The Weird Al Show when the Ear Booker logo appears on the screen. The chance of finding a copy of the album with this bonus track seems to differ greatly now, as many later domestic pressings and most foreign pressings have omitted the "song," instead ending the album with YDLMA. 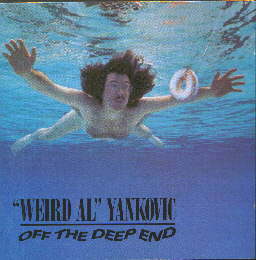 The first song off this album to be performed live was "Polka Your Eyes Out," which Al had performed in 1991 for Dr. Demento's 20th anniversary special on Comedy Central. Off The Deep End ©1992 Scotti Bros. Records. ©1999 Way Moby/Volcano Entertainment III.